If you are not particular about which variety of turkey you want, then here is a great opportunity to save some money and enjoy providing your own turkey for that special holiday meal. Our choice of variety but this assortment will include at least two varieties made up from Broadbreasted Bronze, Giant White, and any of the heritage turkeys. No, the turkeys and chicks are hatched at separate locations due to biosecurity. 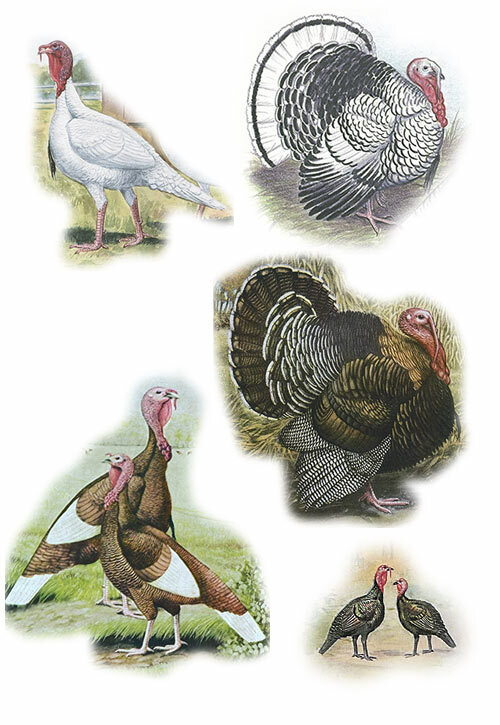 You may order individual breeds of turkeys as long as the minimum order is met of 15. 3 varieties receivedReceived 15 poults last week on Friday and all were lively on arrival! After a few hours one Spanish Black was a bit lethargic but has survived and thrived over the weekend. I did use a vitamin mix in the drinking fount. So far so good, and excited to see what else is in the assortment! Chatty little things!Our turkeys arrived this morning and even though I never got an email letting me know they'd been shipped our post office was great about calling and letting me know. All but one are active,chatting,eating and drinking well. The one that is a little dull seems to be a fighter so I'm hopeful. We ended up with Black Spanish and either Bronze or Bourbons. I'm excited to watch them grow.